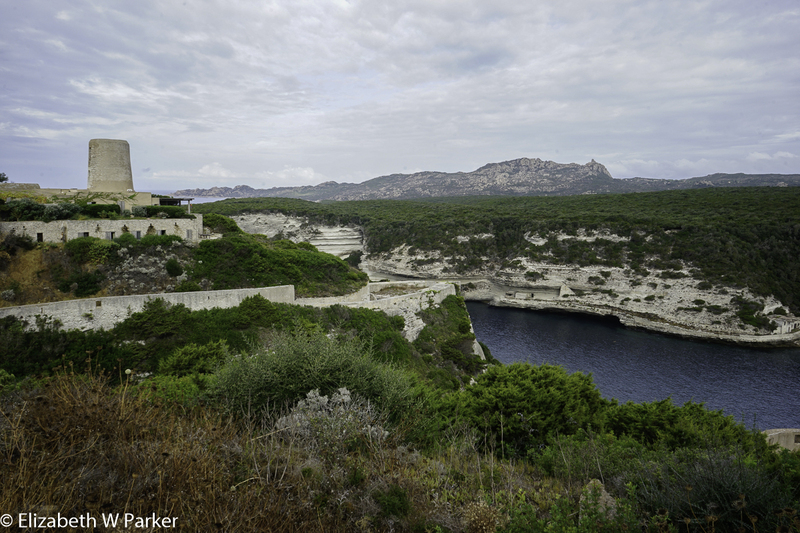 Today we are changing location, leaving our hotel in Sartène to move to the town of Bonifacio for the next two nights. But first – our day’s hike: Today was to be a long day with the hiking estimated to be about 5 hours. 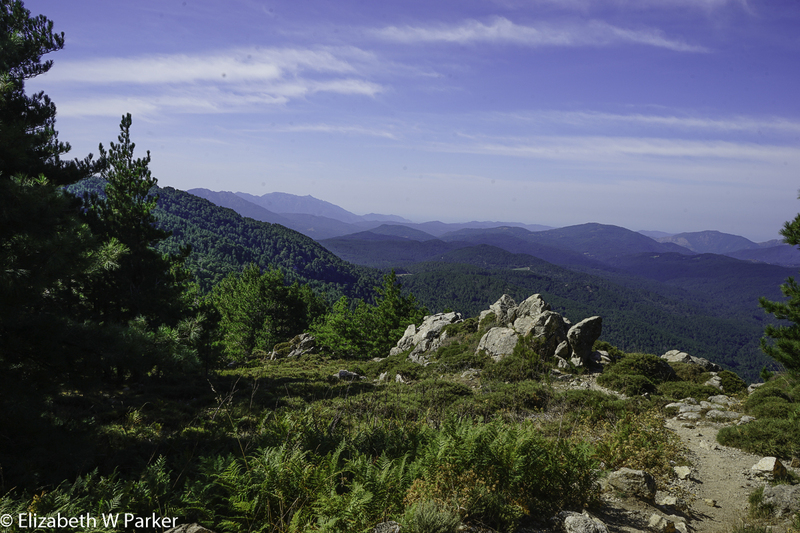 We drove a good distance up into the mountains, basically ending up in the area of the GR 20, a famous hiking route through Corsica, like the Appalacchian Trail in the USA. We drove through some darling little towns along the way, and even stopped for coffee and picked up sandwiches just before we reached the parking area for the Col de Bavella, today’s highlight. The car park was pretty full, and you’d almost despair that the trails would be, too. But, the place must be huge, because we were never overwhelmed by other people. The really outstanding places were pretty well-attended, naturally, but the hikers were spread out on the trails. Here the walk was through the woods, large beautiful pines (laricio var corsicana) with a carpet of ferns underneath. In places, the ground was so churned up it looked like the spot of a mighty life and death struggle. It was apparently the rooting of wild boars. The air was fresh and clear. The views were spectacular. 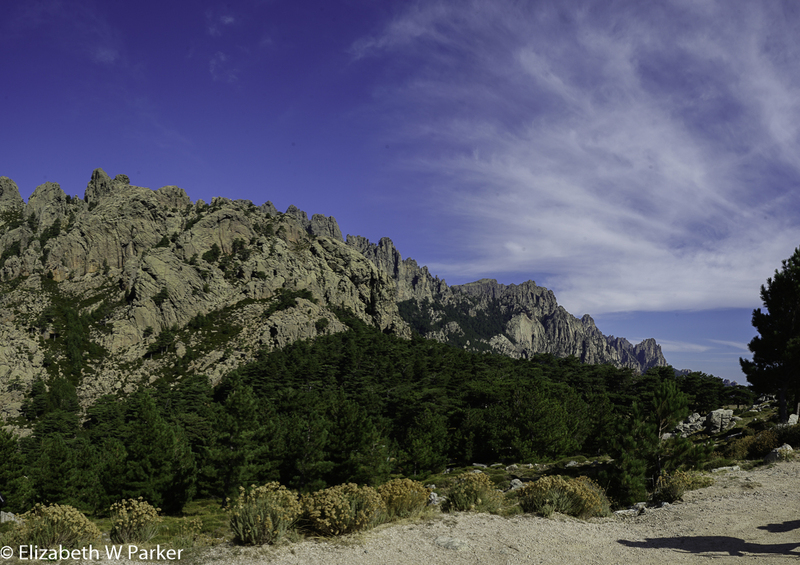 Col de Bavella – Don’t they look fake? Like a movie backdrop? At times, the mountains and the rocks looked almost fake, like the back drop to a movie. The heights were precipitous. The climbing was pretty strenuous, but fortunately the risk of falling was not high. It was steep, but not exposed. We were blessed with outstanding views at every stop for breath or water. 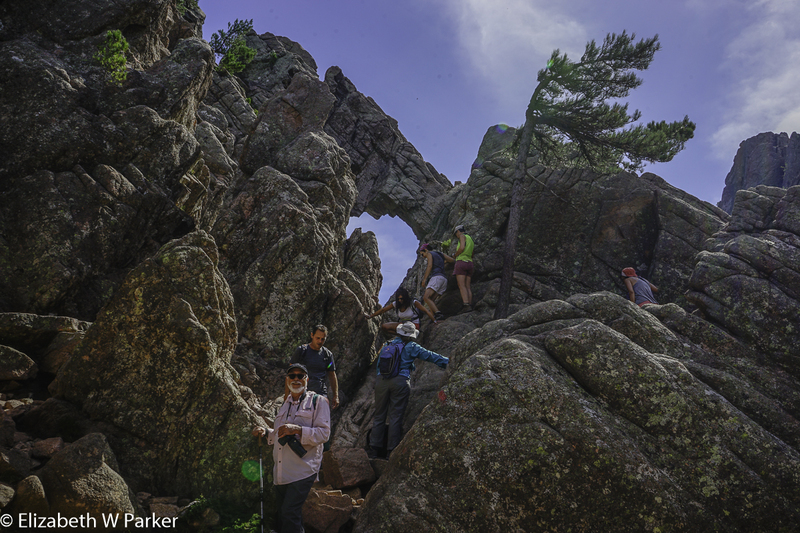 Part of the way up, we stopped to see a natural arch. Very unlike the sensuous curves of the arches we saw in Arches Natural Park, this one was angular and sharp. I did not climb up to be photographed or to photograph…there were lots of people waiting their turns and I needed a breather. I made it to the top, though not without praying that several stops en route were our ultimate stop. The view from the summit was unforgettable. We sat in the warm sun on the granite dome to eat lunch (well, everyone else did!) but the view was so entrancing that really food was the last thing on my mind. 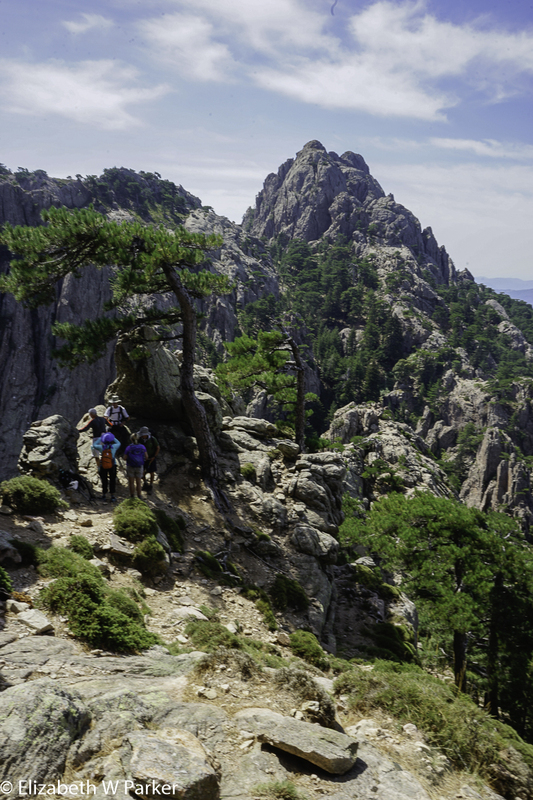 While in Corsica, I was reading Brian Bouldrey’s “The Honorable Bandit” about his hike on the GR 20. 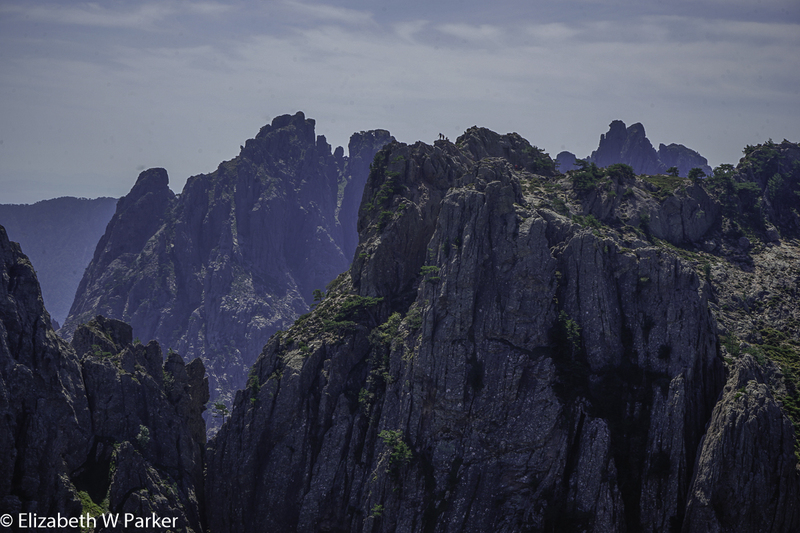 He describes the Col de Bavella range as looking like the back of a gila monster. I had to laugh when I looked again at my pictures. There is definitely a resemblance! I do recommend his book. It can take the place of actually hiking the GR 20 for those of you who are like me and like our hiking well enough, but without taking it too far! His descriptions are great, and you will laugh a lot at his adventures along the trail. I loved especially his comments on the other hikers he encountered along the way. Fortunately, I did not see anyone in our group among those he described, though I am sure he would have found us just as worthy of remarks! The way down was uneventful, scrambling over rocks, trying not to grab spiny plants to keep our balance. I found the way down easier than going up, but I was definitely in the minority. We picked up Gerry along the way. The next group member we had planned to encounter was not in the assigned place, but we did find him lower down. This photo was the source of much laughter after that hike … were we just a bunch of punch drunks? 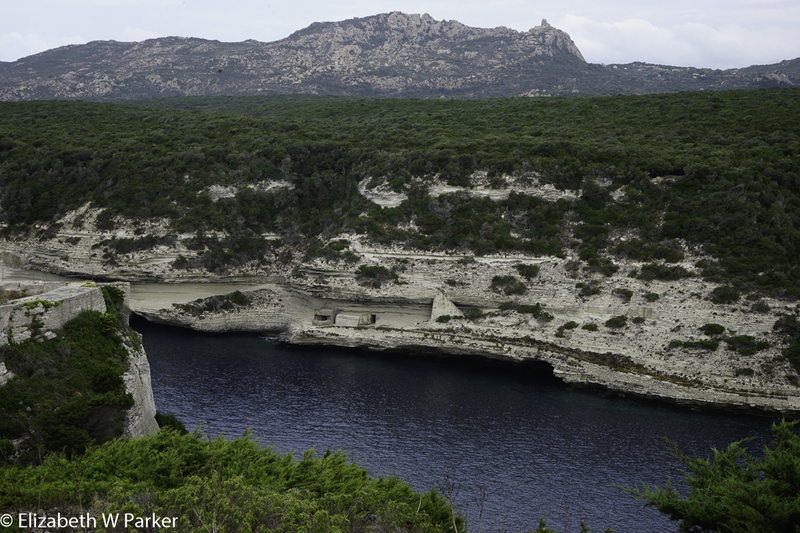 From there we drove to Bonifacio, one of the oldest towns in Corsica situated on limestone cliffs overlooking the straits between Corsica and Sardinia. Our hotel is beautiful – modern and sleek, super clean. We had about an hour and 15 minutes to rest and clean up before going out for dinner as a group. View of the Bonifacio harbor from the hotel. The Citadel is the massive stone structure to the right on top of the hill. Our dinner destination is down along the harbor, la marine, and our hotel is high on the ramparts of the Citadel. The way down is an enclosed stairway, with well-worn steps and windows cut into the sides. It was a little freakish – the steps slanted downward because of the wear of centuries by feet just like ours, and sometimes dirt and sand on them threatened a slip, and sometimes, too, we had to go through dark galleries where we really couldn’t see our feet at all. There was a bit of a rush to get us on our way while there was still sufficient light to get through those areas. It was quite an experience; don’t miss it. You must do it once. We had dinner as a group in a fish restaurant right along the harbor, Les Quatre Vents (Four Winds). It was a cheerful, family place with really good food and obviously fresh fish! But, tired is tired and Gerry and I took the early “bus” back up the hill. I was asleep within minutes of getting into the room – I even forgot to take my contacts out! Look at the strange clouds in this picture of the harbor at Bonifacio at night…Actually, those are not clouds, but patches of the white limestone of the cliffs that rise up precipitously from the water! Map of Bonifacio – shows you how the city is oriented. Today, we set off walking from the hotel. 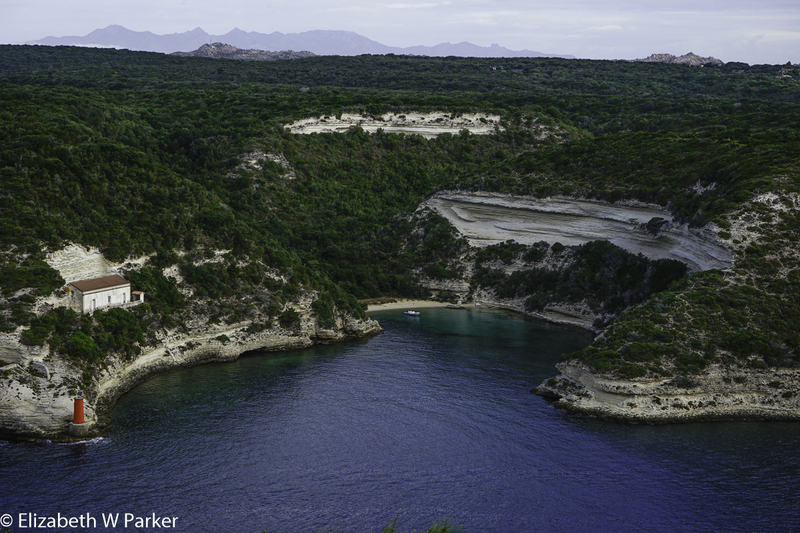 Bonifacio is a long promontory. It’s natural harbor is cut deep into the limestone on which the city sits, sometimes quite dramatically on an edge that has been eroded away beneath! As we look north, from our hotel, the harbor is below us and the upper city is to the east. Our walk took us out along the ramparts and the cliffs to the very end of the promontory. 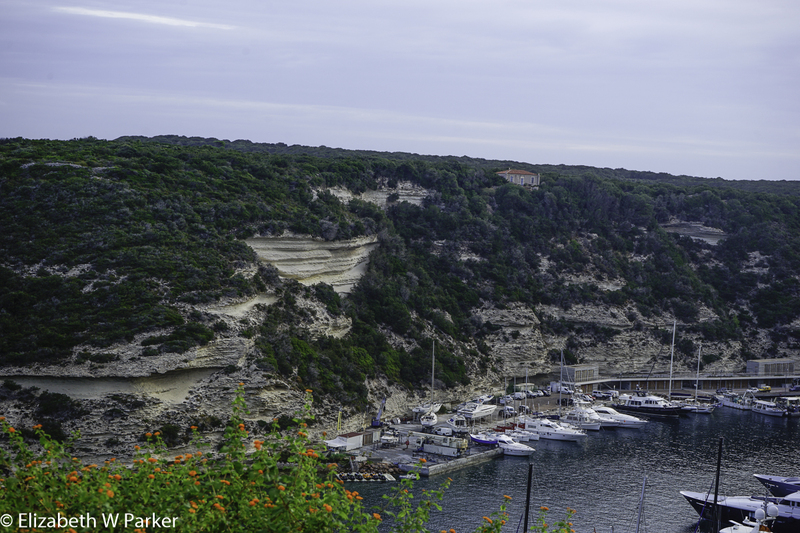 As we walked along the Bonifacio ramparts, we were looking down to the harbor below. The harbor is pretty impressive and has a lot of history. Today, it is filled with impressive yachts, but you can see by the protective curves of the inlet from the sea, that the harbor would be protected from storms as well as attacks. There are even WWII gun placements cut into the limestone cliffs. Below us, that impossibly blue sea shimmers in the sunlight. The city is built on sandstone cliffs that are extremely picturesque. 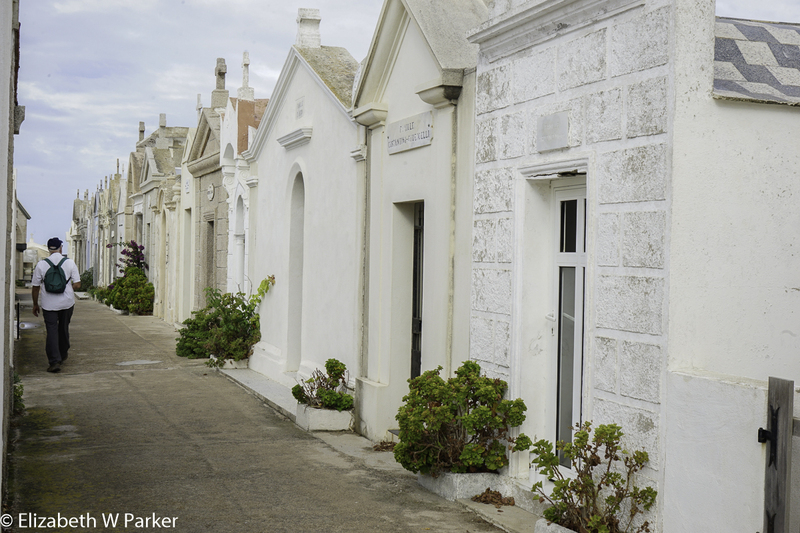 One of the more picturesque mausoleums. Bonifacio, Corsica. At the end of the promontory is an old cemetery. The magnificent Citadel was, in later year, the barracks for the Foreign Legion. The cemetery has many French Foreign Legion graves, as well as family vaults where the surnames are Italian and the first names are French. 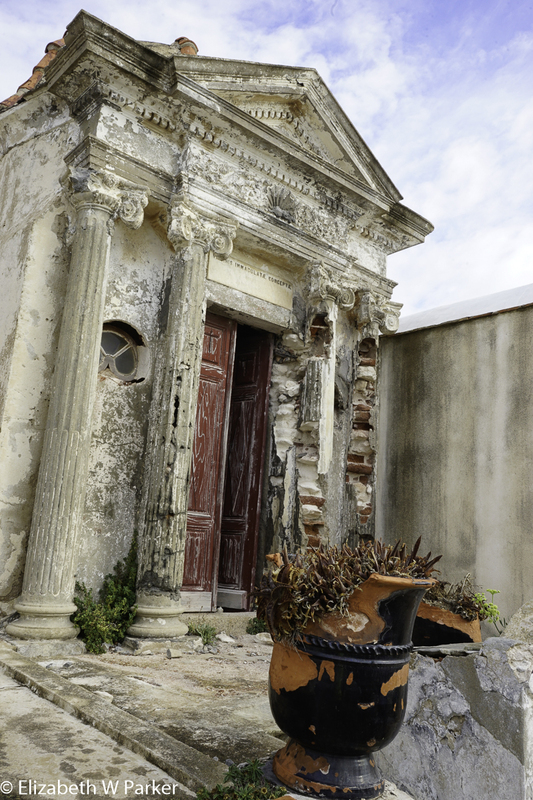 It was a pretty evocative place – lots of variety and history. 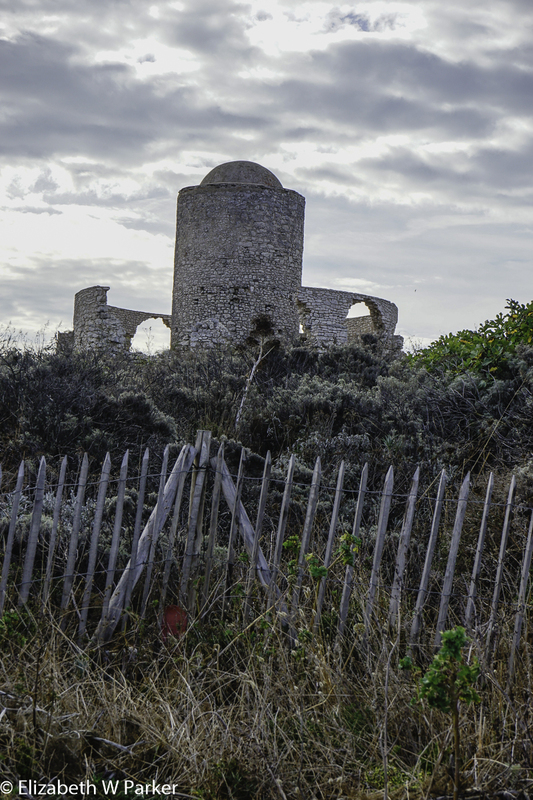 As we walked back toward the inhabited part of town, our walk took us past ruins of 13th century windmills. We also walked through the Old Town, wending our way along narrow streets, our guides pointing out places for dinner, as we will be on our own tonight. I have read many negative reviews of Bonifacio: “Inauthentic,” “over-priced,” “too many tourists,” etc., etc. I did not share any of these negative perceptions. Maybe because it was mid-September, but there were not too many tourists. (Too many tourists is Rome, all year long!) I didn’t find it overpriced, maybe because our lodging and meals were covered in our tour cost. 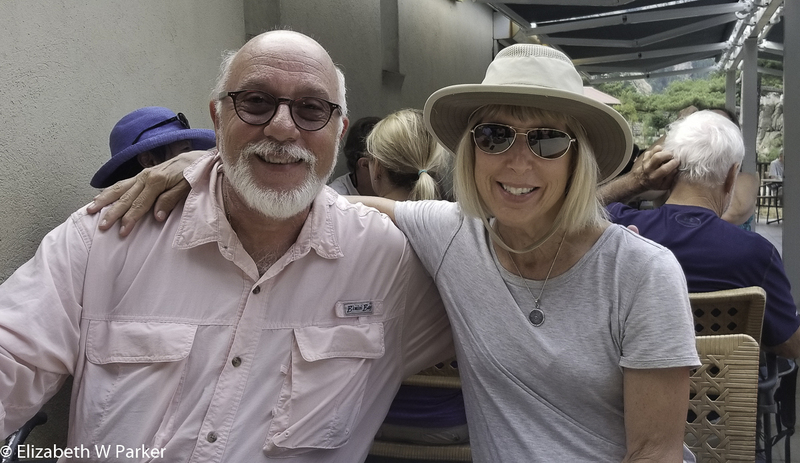 We did have one dinner on our own – (tomorrow’s journal) but I did not hear anyone exclaiming that our meal was over-priced. For the hiking portion of the day, our destination is Capo Pertusato and more incredible rocks. 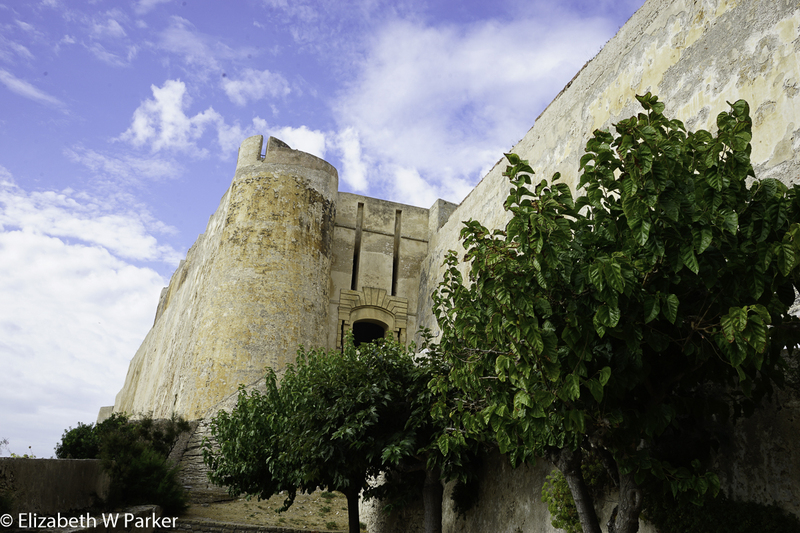 We left the city via a massive gate in the Citadel walls, called the Bastion d’Etendard. It was an immense structure. It is easy to imagine how imposing this citadel would have been. Historical accounts relate that most of the people of Bonifacio lived in this upper city, inside the walls of the fort. The harbor, which today’s sensibilities would have found more desirable, was the realm of fisher folk in the middle ages. 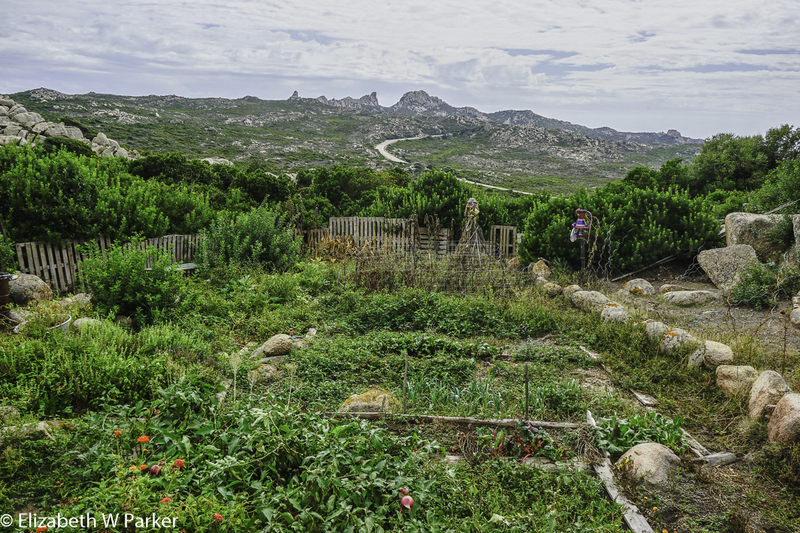 Even Carrington (author Dorothy Carrington, Granite Island) found only rudimentary hotels and tourist amenities here when she came to Bonifacio in the mid-1900s. Emerging from the gate, high in the wall, a long wide ramp stretched down to the the city streets below. We were on the eastern edge of the city, just outside the gate. We can see the harbor to our left and the sea to the right. For the beginning of today’s hike that will be true, and my pictures show that I looked right and left and found great vistas on both sides. The walk took us past the Jardin des Vestiges, a lovely place with ruins and climbing greenery. To leave the city, we picked up the Sentier de Pertusatu via a long sloping ramp (designed for horses) that climbed back to the summit of the rocks that stretch along the coast. Then, following the coast our path brought us ever closer to the point called Capo Pertusato. It was difficult not to stop every 10 steps and take another photo. Once again I will evoke the beautiful color of the water, and how clear it was. The city perched on its eroded white cliffs seems impossibly fragile and ephemeral in the sunlight. Capo Pertusato, (“pertusato” refers to “drilled” as in holes), is the southernmost point in Corsica. The beach there is dominated by a huge wind and water-sculpted rock that looked menacing to us. The sky had clouded over (in fact it had started rained during our mid-morning refreshment break), and the backdrop to the white stone was charcoal grey. There was also a large cavern in the ground carved by the waves, partially filled with water. High above us was the lighthouse – the topic that dominates all the Google references I could find for Capo Pertusato. We lingered on the beach long enough for some to swim, then retraced our steps to the vans and headed off to lunch. 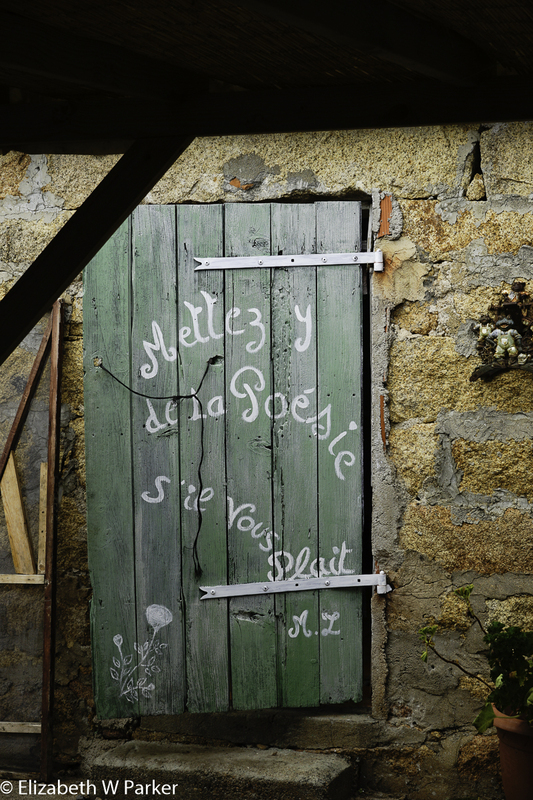 The bergerie from the road…the magic is hidden! 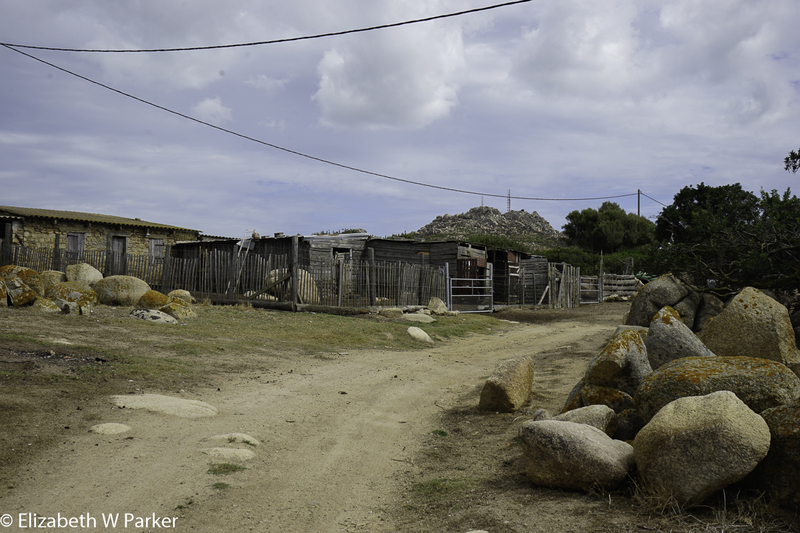 We had lunch in a bergerie – a shepherdess’s digs (Bergerie du Catareddu (Catarello)). The sheep were out, but behind the unpresuming facade on the road, was a campy space with long tables under shade. A pink, flowery home-made runner ran down the center of the broad board table, there were pink napkins for each of us,and jars of flowers served as centerpieces. It was simple and rustic and very welcoming. Pitchers of rosé on the table added to the delightful color scheme. Definitely the food was the focus and we were delighted with the fare! The atmosphere of a long table, surrounded by friends, is one of my most indelible memories from the years I lived in Italy. It is a scene I love to create at my own holiday tables. Lots of people chatting and laughing, as many bubbling conversations as there are groups of 2-3 to participate, a constant fluid changing of orientation from the person on your right, to one on the left, to one across the table. Many topics start with one little group and then gurgle down the table. Only occasionally does the group become suddenly silent to hear one comment, before all going off in their own directions again. It is a happy memory for me, and it makes me happy to observe even when I am not actively involved in a conversation. This was such a lunch. The view out to the mountains. Stretching out in front of me, beyond the other tables and the shepherdess’s garden, was the mountainous terrain covered in macquis that obscured the water from our view. Without the distraction of the sea, I took time to look around me. This is the venue for what in Puerto Rico would be called “noches de bohemia.” (Bohemian nights?) A poet reading her work, musicians playing for a crowd – little performance events that give people an excuse to get together and share some time over a glass of wine or beer, or even the famous mirto (myrtle liquor – but not too much!) As I write this it comes to mind that it is a bit like going to a sports bar to watch an American football game. Sure you can do it at home, but its more fun with others, especially strangers! The shepherdess (and isn’t that an old fashioned word! ), Noeli, is a woman in her 40s. All of the production she served was created right here, on her property. Her mother and sister/aunt (?) helped with the serving. At the far end of the table sat the men of her household and a functionary who had come to inspect her farm. Would it surprise you if I said not one of them got up, even to serve himself? Even lovely languorous meals have to end sometime. When ours did we returned to Bonifacio. We had the rest of the afternoon and evening off. 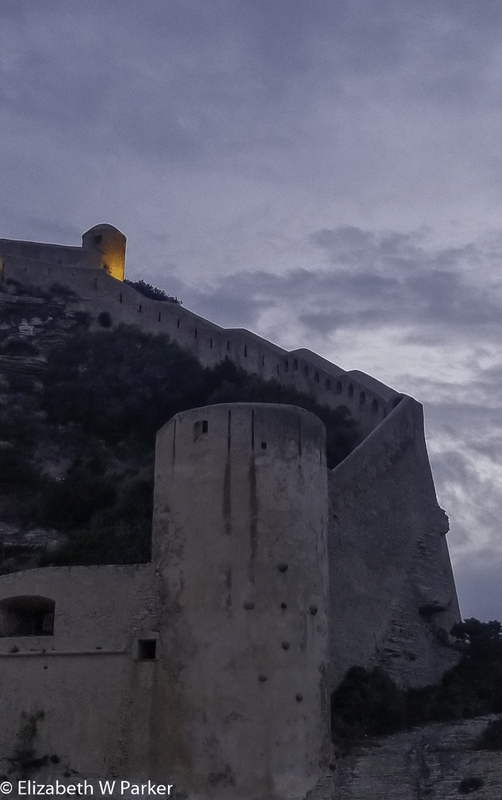 Cindy, Greg, Gerry and I took a evening stroll through Bonifacio’s old town, the vieille ville or haut ville. The streets, as I remarked in the morning’s amble, are narrow. Stone buildings line the sides. Most have shops or restaurants on their lowest levels, and residences above. The city is quite old and many of the oldest buildings have been seamlessly incorporated into more recent construction, even that more than 100 years old. We stopped for a drink in a little place just in front of the cathedral. The cathedral is interesting for the large loggia that covers the main entrance. It was probably a meeting place for town government functions. Another remarkable feature of the town is the water catchment system – a series of arches over the streets funnels rainwater into a public cistern. We had dinner at the Stella D’Oro Restaurant. Good food and wonderful waiter made for an enjoyable evening! Evening sun lights up the the cliffs along which we walked in the morning. Tomorrow morning we will leave Corsica and board the ferry for the hour’s ride to Sardinia. It will be sad to leave as we have had a wonderful time. But, more adventures await! Keep reading!